We're happy to announce that the Redress Design Award 2018 (formerly known as The EcoChic Design Award) is now open for applications until 13 March, 2018! We are on the search for the next group of designers who have what it takes to rethink fashion and who will join us in Hong Kong in September for the grand final at Hong Kong CENTRESTAGE. After seven highly successful years, we are rebranding the EcoChic Design Award to the Redress Design Award. This exciting move coincides with the cycle becoming truly global in 2018 and will further align the competition with Redress and our overarching vision to reduce waste and fuel a new circular system for fashion. The 2018 cycle will be open to emerging fashion designers and students with less than three years industry experience, in all countries across the world, for the first time in the competitions history. Application criteria, design brief etc can be found in the application guidelines here and online applications can be submitted here. Please find attached a PDF presentation about the competition if you wish to introduce to students in class (AboutRDA2018_ENG_Final.pdf). Please find attached an A4 size printable competition poster (RDA2018_Poster_EN_TC.jpg) and, other competition images can be found here. Please do help us to spread the word on your social media channels to maximise our chance of reaching as many young talents as possible worldwide. Please find below a couple of suggested call out social media messages for your ease. As partners of @getredressed we're excited to announce that the 2018 cycle of the world's largest sustainable fashion design competition - #RedressDesignAward (formerly the EcoChic Design Award) - is now open to emerging designers and students globally! Apply now at redressdesignaward.com to spark new approaches to sustainability. 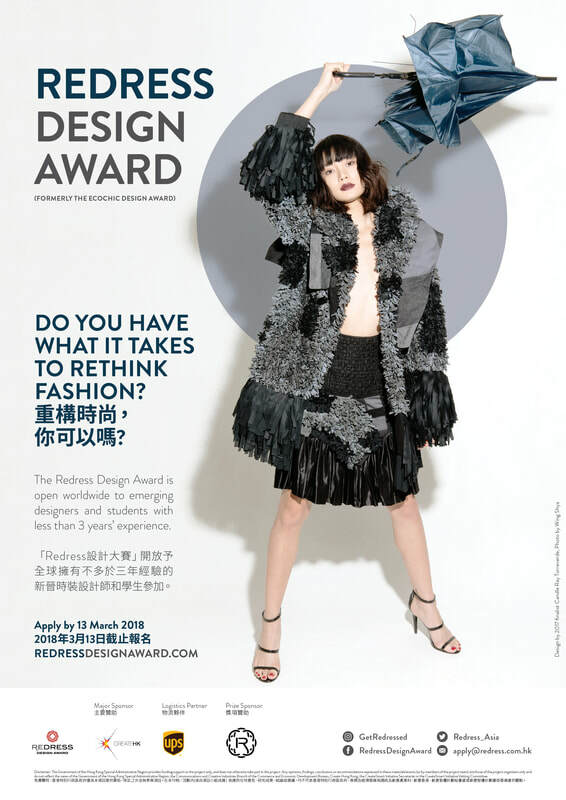 As partners of @RedressDesignAward we're excited to announce that the 2018 cycle of the world's largest sustainable fashion design competition - #RedressDesignAward (formerly the EcoChic Design Award) - is now open to emerging designers and students globally! Apply now at redressdesignaward.com to spark new approaches to sustainability. Please do get in touch if there are any questions. Thank you very much for you ongoing support! Greetings. I am pleased to invite you to submit your interest to contribute a chapter/chapters for one of my upcoming books,"Sustainable Innovations in Textiles & Fashion" to be published by Springer Publications. Attached is the detailed table of contents, and you may reply me your intended title (any other suitable title related to the theme will also be considered) with an abstract, list of author names, affiliations, CV's of authors, etc. Last date to submit the abstract and the other essential details is 15-July-17. I remain if you have any further questions about this captioned book. Springer Publications will publish a book, as an edited collection, on “Sustainable Luxury – Cases on Circular Economy and Entrepreneurship”. Attached you can find the “call for papers (cases)”. Please note the schedule: if you are interested in taking part of this book, you should send your abstract no later than August, 29, 2017. Please kindly meet this deadline since the publishing house has put a very tight schedule. Finally, I would like to thank you for sharing this information with your colleagues. Thanks in advance, and I look forward to hearing from you.